Sunderland were held to a draw by Oxford United over the weekend, and the Black Cats continue to lose ground on the fourth spot in the League One. However, they have games in hand over their rivals, but the League One outfit needs to start winning their games soon if they want to get promoted to the Championship through one of the automatic promotion spots. The Wearside outfit are soon going to be in action again as they are set to face Blackpool who currently occupies the 8th spot on the league table. Blackpool’s last league defeat came against Sunderland, and since then they only lost to Arsenal in the FA Cup. The home fans need to get back behind the players as Sunderland are entering the crunch phase of the season. Team News: Donald Love is a long term absentee. Lee Cattermole could be rested once again as Jack Ross indicated earlier that he wouldn’t want to risk him by rushing him into the playing eleven. Jon McLaughlin is a nailed on starter in goal for Sunderland. Jimmy Dunne scored a goal at the weekend, but it wasn’t enough in the end as Oxford managed a grab a late equaliser. He is likely to start in the heart of the defence. Tom Flanagan is likely to be his partner, but Jack Baldwin is also a strong contender to start. However, we are going in with Flanagan for this game. Reece James should start in his usual left-back role. The right-back spot is expected to be occupied by Adam Matthews. 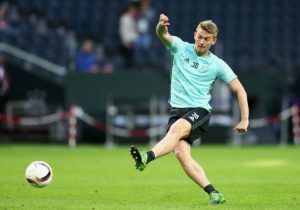 Former academy product Grant Leadbitter is likely to start in midfield as long as Cattermole is out of action. Max Power should get the nod to start in a deeper role alongside him. Both of them would be expected to protect the back four and establish Sunderland’s dominance in midfield. George Honeyman is expected to start in the attacking midfield role. The experienced Aiden McGeady is set to begin the match on the left flank. Lynden Gooch is available for selection, but we would like to see Lewis Morgan start once again on the right. However, Gooch is also a top candidate to feature in that position. Sunderland’s marquee signing Will Grigg made his debut against Oxford, but he had to feed off scraps for most of that game. The former Wigan striker would hope that his team-mates can present him with some decent goal-scoring chances in this home tie. The Northern Irish forward is expected to lead the line for the Black Cats up front. Rangers Send Out-Of-Favour Attacker To Prove Himself In The League One: Good Move By Gerrard? Impressive Leeds United Ace Signed On Loan By Blackpool: Should Bielsa Have Held On To Him?